What advanced courses in visual arts do you offer? Following an introductory course in Studio Art, Overlake offers classes in Drawing, Painting, Graphic Design, Industrial Art, Sculpture, Architecture, and Photography. An Advanced Studio Art course is offered every other year for students wishing to pursue more independent projects or a specialized medium. When can my student begin study on an instrument? Beginning band and beginning strings elective classes are offered on Mondays and Wednesdays from 3:15pm to 4:15pm. Instruments taught are violin, viola, cello, string bass, trumpet, trombone, flute, clarinet, and percussion. Though primarily designed for 5th graders, any middle school student may attend these classes. Which music ensembles require an audition? Upper School Chamber Choir and Jazz Band require an audition. 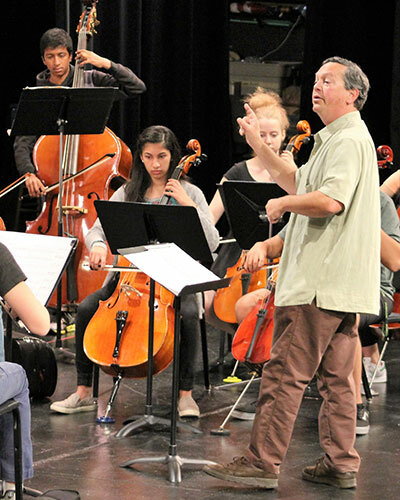 Chamber Orchestra enrolls students based on proficiency on their instrument and, while generally an upper school course, some middle school students may enroll if they have achieved the necessary skill level. My middle school student loves theater. What options does he have for being on stage? All middle school drama and technical theater classes are held on the stage and include and end-of-semester presentation. The annual 7th & 8th grade Performance Workshop culminates in a weekend of public performances. Middle school students may also audition for the All-School musical and the 5th & 6th grade musical, both biennial events. Overlake offers Project Week and summer programs designed to inspire theater students both on the stage and behind the scenes. A variety of student-run clubs are also dedicated to the performing arts. Do the theater productions rehearse after school? For the majority of Overlake productions, which stem from classes, rehearsals are contained within the instructional time until the end of the rehearsal period, when longer technical and dress rehearsals are required. These after school rehearsals generally begin at 3:15 and end between 4:30pm and 6:00pm, depending on scheduling. The only production that rehearses entirely after-school (and some Saturdays) is the All-School Musical, every other year.